Yesterday I experimented with print-mixing for the first time, and had a great time doing it. I heard on the local morning news (clearly its important enough to make the news) that the easiest way to mix prints is to use a unifying color, and I found that black worked for my purpose. Perhaps this outfit is a little over the top for me, but I can just see myself wearing it on late spring picnics and pulling a sweater over it to sit by a fire in my backyard. Most people hate the dresses/skirts with sneakers combo, but I feel more comfortable stepping out of my box if I don't feel like I might break an ankle while doing it. You look adorable, and I think a plaid and floral are a lovely mix. The sneakers are tres cute! super cute! i adore the mixing of you prints! I definitely think this works really well! I love mixing prints - it's such a fun trend. You pull it off perfectly! I absolutely love the print mixing. I wish I had more ability to do that, but I am not brave enough to try. That's a perfect outfit. I too hardly mix prints, but I really like how you did it. Converse and skirts looks awesome. Oh I Loooooooove that skirt,you look beautfiul! yeah but converse are ok!! they look cute and quirky and you totally pull it off! they look great together! and I love converse with skirts or dresses! always makes me feel about 5 years younger! I'm still new to print mixing myself. This definitely works. 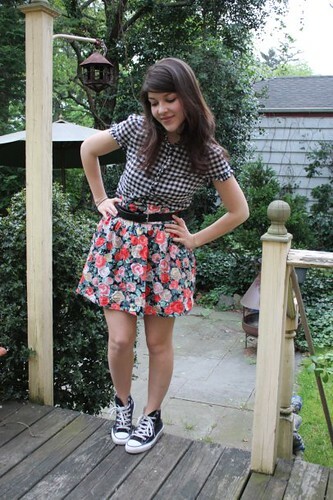 I also love the floral skirt paired with the chucks. Always classic. Floral skirt+all star=deep deep love! i have to say, it's miu miu ss10 which has got me starting to love prints! thanks for the tip! i will have to check a musem for geodes.Thanks for taking the time to stop by my blog! You are so adorable! And I definitely came so close to buying that skirt. Great minds think alike! So adorable. Haha my mom is one of those that hate the sneaks/dress combo, but I love it! And I love the way you've mixed prints, perfect! You know what, it actually works...I barely noticed that youve mixed prints. It goes well with your chucks too. I think you look COOL! :) x Take care..
its a nice final touch..